Our vintage bands are a mixed bag – we have 1920s-style vintage bands celebrating speakeasy-style loucheness and Gatsby glamour, bohemian 1930s bands playing gypsy jazz, and big bands and Andrews-sisters style female vocal groups for 1940s-themed parties. We have vintage rock bands specialising in 50s skiffle and rock'n'roll as well as 60s Merseybeat. We also have bands putting a modern spin on folk music. Think Mumford & Songs, braces and flat caps! Function Central are wedding specialists, and we provide vintage wedding bands for thousands of brides and grooms a year. Bookings are secured with easy-to-understand contracts, and help and support is provided right up to your wedding day. What's more, hiring a vintage band with us gives you our live music guarantee: in the unlikely event of something preventing your band reaching you on the day, we can find you a replacement band at the drop of a hat (well, within hours). Whatever your vintage vibe, we have the retro band for you! 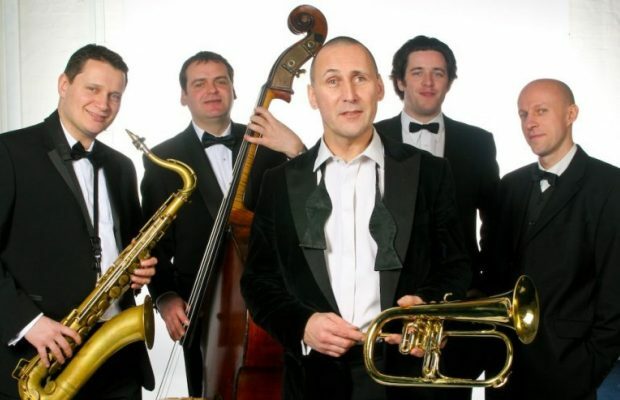 Instrumental swing band playing a repertoire of classic 1930s jazz standards. Additional musicians also available. A charming gypsy swing band evoking the swinging sounds of 1930s Paris – sure to get heads bobbing, toes tapping and the party in full swing! Virtuosic Hot Club-inspired ensemble breathing new life into gypsy jazz originals with their intense brand of swing. From Django Reinhardt to Fats Waller, the band’s innovative approach is revitalising this classic genre. Classy vintage style gypsy jazz/swing band featuring refined female vocals, two guitars and double bass. The band play jazz, swing, Latin, bebop, fusion and modern music. Swinging gypsy jazz style acoustic duo playing toe-tapping tunes from this exciting genre, as well as some swing and modern songs. Trio also available. Traditional gypsy jazz and acoustic swing band playing standards by Django Reinhardt as well as swinging renditions of modern artists. Available as an instrumental line-up or with female vocals. Superb gypsy jazz trio playing a lively and eclectic mixture of Latin and jazz standards, with some surprising pop covers thrown into the mix, too. Extra musicians and solo guitar sets available. Low season and midweek discounts. Dressed in snappy suits and circular skirts, this young, high-energy 50s tribute band leap effortlessly from rock’n’roll hits to mellow prom-style ballads. One of the slickest, sexiest, most entertaining bands on the circuit, playing the classic R&B and rock'n'roll of the 50s and 60s – the music of Etta James, Little Richard and Ray Charles –and delivered with a 21st century attitude.